Worms for Compost Purposes. These are the best worms for composting kitchen scraps. Some worms make better composting worms than others. If you use inferior worms for compost and they'll do the job... eventually. Red wiggler worms are the cadillac of composting worms with voracious appetites and a greater tolerance for confinement. Compost worms eat their way through scraps that often end up in the landfill. 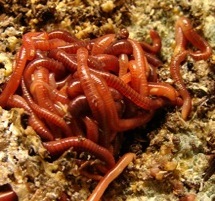 Red wigglers have a few traits that make them a better composting worm than other worms. Big eaters, by worm standards, red wiggler worms convert trash to worm poop in about half the time it would take an earthworm to do it. Composting worms work even faster if their food is chopped and soft. As well as having a healthy appetite, the red wiggler compost worm also has an easier time adapting to the confines of a worm composter. It may take a week or two but the little critters normally settle into their new home and are more likely to stay there than other worm varieties. Here are some worm food do's and dont's to keep the critters healthy and happy. Feed your worms vegetable and fruit scraps, eggshells, coffee grounds and filters, tea bags, human or animal hair and nail clippings, dust bunnies and the dirt from your vacuum cleaner bag. Add non glossy papers and cardboards including junk mail, paper towel, tissue and boxes and cartons made of cardboard (soak cardboard first). Also, bedding material can include coco coir, straw, hay and well rotted manure. Citrus peel, onion, garlic, hot pepper and products that have a high level of pesticide residue (like non-organic banana peel). Worms don't like an acidic environment and will try to escape. A half cupful of gardeners lime sprinkled over the contents of the worm bin periodically, will help to keep PH levels within normal limits. Meat and bones, fat and oils, dairy products. Leftover plate scrapings that have a lot of salad dressing, oils, butter or sour cream should be disposed of elsewhere. If you're using the red wiggler worms for compost bins, they'll typically eat an amount equal to half their body weight each day. 2 pounds of worms will dispose of 1 pound of food per day. As the worms multiply you'll be able to increase the amount you feed them. Worms For Compost ~ How Many Worms? The more the merrier. Start with 2 lbs or 1 kilo of red wiggler worms - that'll translate to roughly 2000 of the little guys. Remember that healthy, happy worms will reproduce, doubling their original numbers in 4 to 6 months. It takes 3 months or so for the babies to mature and, like most babies, they won't eat much during infancy. Once they mature, you'll have expanded your colony and can add more food, make a worm farm for a friend or sell the excess worms to composters or fishermen as bait. Mature red wiggler worms have a distinctive raised band that encircles their midsection. For the first week or two in a new worm composter the worms may seem unsettled and exhibit odd behaviors (for a worm). It can take up to two weeks for the worms to settle into their new residence. Make sure that the environment is that ideal combination of dark, damp and cool (as close to 70 degrees F as possible although they'll tolerate temperatures between 50 and 78 F.). Worms For Compost ~ Where Can I Get Red Wiggler Worms? Compost worms can be purchased by mail, online or at most outlets that sell worm composters. Garden and landscaping stores, especially if they're green at heart, often have a supply of composting worms. Craigs list and ebay are other possible suppliers. As with almost everything in nature, the worms will work together with other organisms to break down the materials. Other insects and organisms form a symbiotic relationship with the compost worms to break down your materials. Expect to see other types of insects and their eggs when you inspect your worms. For compost that breaks down quickly, these organisms are necessary. A healthy worm farm is a productive worm farm. Choosing the best type of worm for compost projects improves the outcome of your efforts and ensures a high quality end product. The best worms for compost purposes are the red wiggler worms. Almost any worm will produce results given the right environment, but red wiggler worms do it twice as fast, and they're happier doing it.